Welcome Blanket is a crowd-sourced collective action of art and activism. By design, we connect with host institutions to display all of our Welcome Blankets and notes together. Then, we pack up these beautiful and heartfelt works and distribute them to refugee resettlement partners. While we won’t have a physical gallery show for this special "on call" situation, we will be creating one online. We need your help! Before sending your blanket, please take pictures we can share of your beautiful work here. We will list your name, city and state (never your email or full address). If you would like your submission to be anonymous, please let us know so we can honor that choice. Welcome Blanket sees this special case as an opportunity for us to proactively, positively, creatively and meaningfully help asylum seekers and reuniting families who are in limbo. Why: Because you want to show your support in a personal way. Because seeking asylum is a human right. Because if you were ever faced with having to run for your life, you would hope that someone would treat you with dignity and respect. Because there are people who are caught in limbo, released for their court hearing and having to wait on average over 700 days. Because you know you can make a difference and this is one small way to do it. Make a blanket. Share your care. The main idea is to give something from your hands to a new neighbor with love. 40”X40” is preferred and here is a pattern to get you started. (Strong preference for machine-washable Welcome Blankets.) For everyone who loves Welcome Blanket, and is not a crafter, this is a great opportunity to jump in. If you are craft-curious, a no-sew fleece blanket will work well, too! Upload images of your Welcome Blanket and Note. I made a simple survey with an opportunity to share your family’s immigration/migration/relocation story and share any extra images you would like. Full disclosure, I would love to publish these as a book sometime in the future, so if you don’t want your name mentioned, please just tick “anonymous”. I will never publish or share your email or full address (just city, state), it’s only information for me to be able to contact you in the future and know where our community is. If you are working in a group, sending in bulk is fantastic! If you received an email that looks like this, you are already on our list. We are honored to have been part of the Fuller Craft Museum lineup in 2019. Also on view during the pop up was Tom Kiefer: El Sueño Americano – The American Dream and Mano-Made – New Expression in Craft by Latino Artists . Something that was incredibly moving to me was how Tom Kiefer collected the orphaned objects of migrants and turned their presence into art. Welcome Blanket, in many ways, is a counterpoint to the experience that many people have had of losing the few objects they possessed crossing the border. A Welcome Blanket gift is a practical and symbolic object of welcome and warmth for a new chapter in a new land. If you have a chance to visit Fuller Craft, these intense and thoughtful exhibitions are still on view. Thank you to Fuller Craft for including Welcome Blanket as part of the conversation about immigration and craft. We are so honored to have been a part of Betsy Greer’s “Making Change” exhibition at MODA. The Following is a recap of the Welcome Blanket Project at MODA. It has been republished here with permission. Here’s a link to the original. Nov. 28th - Photo Update @Smart Museum! Mid-November Welcome Blanket Photo Update! It's mid-November here at the Smart Museum - check out some pics of our progress! Late-October at the Smart Museum! Welcome Blanket continues to grow......here are some shots from Oct. 24th! Welcome Blankets are pouring in. We now have over 1500! You can see about half of them in the gallery and the others are going through a mass-freeze. We are stacking and overlapping and preparing for more. 1. "Do I have special skills that could benefit Welcome Blanket?" You probably have a superpower. We all do. Maybe you are fantastic with logistics, a writer, a photographer, a social media guru, a teacher, an incredible cook, a translator, someone who finds things super inexpensively and can bargain like crazy, a psychotherapist, a videographer, a documentarian, a story teller, a web designer, a graphic designer or illustrator, an attorney, a connector, an incredible thinker, etc. Whatever skills you have, we can find a place for you on this project. Welcome Blanket is about inclusion, and that includes you. 2. "Am I an okay to expert knitter, crocheter, weaver, quilter, sewer?" Offer up your talents. You can give advice in person or over social media. Let people know you are ready to share your knowledge if they are involved with Welcome Blanket. Being a beginner knitter myself, I love asking for advice in person and appreciate all the help I can get! 3. "Am I interested in learning a new skill?" Welcome Blanket is the perfect opportunity to begin knitting, crocheting, weaving, sewing or quilting. Try it out! It’s okay to make mistakes. So many different blankets! All are welcome! This blanket from @lovelyarns is a wonderful group effort. Can you imagine how wonderful it will be to receive this gem and its accompanying stories and words of welcome? 4. "Am I, or will I be in Chicago?" We would love your help with unpacking parties. Currently, we have over 700 blanket packages in the Smart Museum storage area that are ready for freezing, cataloging and install, and more arrive every day! We love the enthusiasm of our Welcome Blanket makers and we have committed to showing all the blankets sent by November 4 (We will happily take them after, too). There is something particularly special about opening up the deliveries, touching this beautiful work, reading welcome notes, and being a part of the installation team. We have a standing unpacking party 1-4 on Saturdays, and we are creating more. No prior experience is necessary. Groups and individuals are welcome. Get in touch with jharness@uchicago.edu for more details. Here's a peak at the incredible piles of packages ready for unpacking! Welcome Blanket Unpacking Party in Progress! 5. "Do I have an organization, business, or home with space for people to gather?" You can host a knitting circle in other places aside from your home. You don’t even have to be a knitter! Dance studios, coffee shops, bookstores, boutiques, art galleries, ski lodges)– all could be potential “knit in public” places. You can also invite people to gather in your home to make Welcome Blankets and talk about immigration. As with any other situation, always be sure to be safe. If you can host a party, you can host a Welcome Blanket gathering. 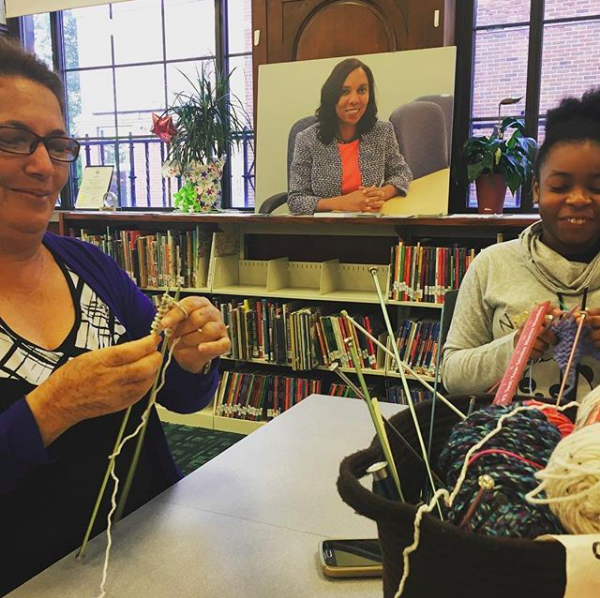 Host a knitting party and invite friends to knit, talk about immigration, and learn more about the project. Take photos and post them on social media using #welcomeblanket. You can host a meetup in your own home or perhaps at a local coffee shop. Remember to post about it on our Gatherings page if you want more people to be able to know. 7. "Do I know of a retirement home, assisted living facility, rehab facility, dialysis clinic, hospital or another place where there may be knitters who are not on social media?" Contact the social coordinator of the facility. Let them know that this type of project is therapeutic and can give purpose to people who may feel powerless. Really! Maybe you could even visit and knit together! Let them know about the Welcome Blanket installation at the Smart Museum Encourage them to go and share their experience (#welcomeblanket). Because the show is constantly evolving, they can go multiple times and the experience will be different. You can also encourage them to participate in unpacking parties! Here's what the Welcome Blanket show looked like on September 27. We are so grateful for all of the incredible creativity, work and kindness of those involved in the project. 9. "Is there a knitter/crafter in my life?" Talk with her, or him! Share information about the project. If she/he is physically nearby, go and be with her as she works on her #welcomeblanket. This goes for all of us; we are living in stressful times. Self-care is essential. One way to manage stress is through knitting, or crafting. "Might crafts such as knitting offer long-term health benefits?" from the Washington Post and "Should you knit?" from Psychology today bring up multiple studies and possible explanations for why crafting in general and the repetitive approach of knitting in particular are good for one's mind and mental state. Here's an image from the Olneyville Library. Welcome Blanket is a great opportunity to get together with neighbors. Start thinking about your accompanying note to the immigrant who will receive your blanket. Talk with your family or do some research around your family's arrival to the United States. Share your story using #welcomeblanket. We are working on creating a way for people to share their stories widely (even if they are not creating a welcome blanket). 12. "What concerns me about current immigration policy? How do I start the conversation?" This is a big topic, and one that evokes big emotions. Here’s a list of possible questions to start off the conversation while you knit your blanket. Feel free to use our guide whether or not you are crafting. A large part of Welcome Blanket is creating a space for dialogue. We have binders and binders of welcome notes and stories. All are being recorded and numbered to match with their blankets. Come on in and read some. You do? What a wonderful reason to put together different yarns! You can make a blanket from the yarn you have, or share! There are a few ways you can contribute financially. Check out our locations page and see which local yarn stores have “Donations Welcome.” Call them and talk with them about donating funds (or supplies) for making Welcome Blankets. The Smart Museum of Art is also fundraising (contributions are tax-deductable) to help cover costs of shipping, programming, etc. 15. "Am I part of, or do I know a group that should partner with Welcome Blanket?" We love to collaborate and partner. This project’s power lies in part in how we all connect and help one another. Perhaps you are part of a group that is in crafts, refugee resettlement, immigration rights, etc. From encouraging your local crafts store to sign up to be a visible partner to connecting us with refugee resettlement groups to introducing us to artist and civil rights organizations, you can be that incredible connector that helps us build a network of inclusion and support. Welcome Blanket is all about collaboration and inclusion. Here's a pic from Politicon. Of course you do! Check out my previous blog post for ways to spread the word. You may have some additional ideas. Chicken the Dog recommends taking some printouts about Welcome Blanket to take to the dog park. She's great with PR. As always, thank you for being a part of Welcome Blanket. It's our collective action that makes this project resonate. Let's keep it up!